A healthy "lasagna" made from layers of butternut squash! This dish was inspired by a recipe my sister-in-law sent me from her local newspaper. I made it nutritarian and vegan by leaving out the oil, salt, and cheese. 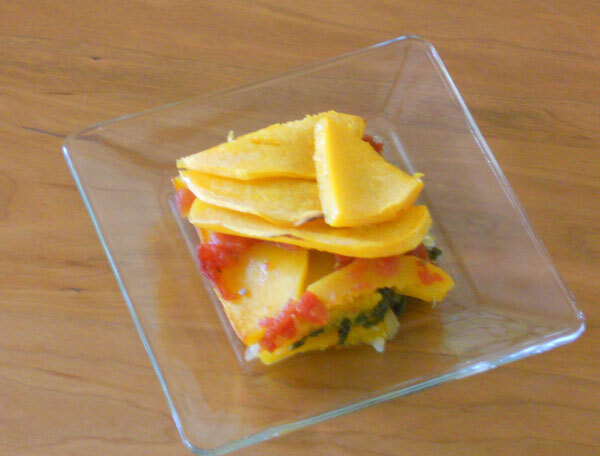 The sweeter the squash, the better this dish will be! Preheat the oven to 350°F. Spray a 9-inch by 13-inch baking pan with nonstick spray and set aside. Water-saute the onion in a skillet on medium heat until soft. Add the kale and a little water, cover, and steam until kale is tender, about 5-10 minutes. Drain the kale mixture of all excess water (if it's very wet, place the kale mixture in a colander and use a spoon to press out the water) and set aside. 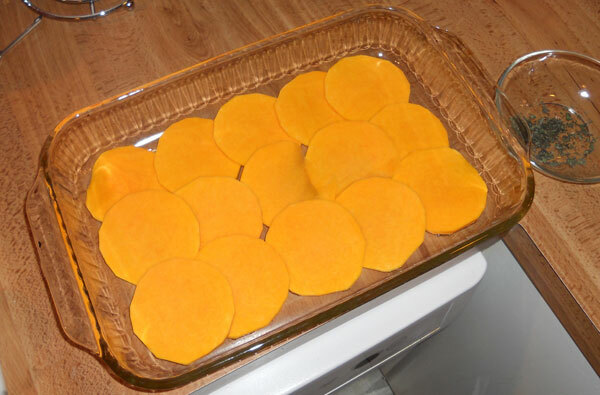 Meanwhile, peel the butternut squash, remove the seeds, and slice as thinly as possible, about 1/8-inch. 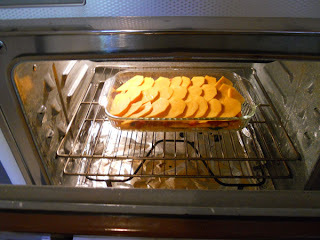 Cover the bottom of the baking pan with an overlapping layer of squash slices. Top this layer with the cooked kale mixture. Season with salt and pepper, if desired. 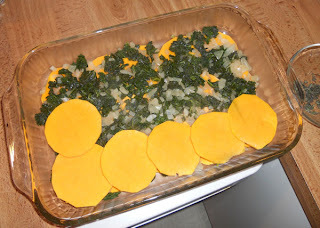 Add another overlapping layer of squash. 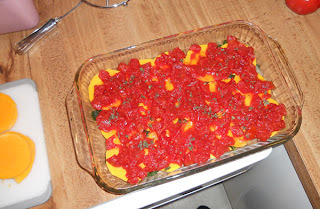 Top this layer with the diced tomatoes and fresh sage. Cover the tomatoes with a final layer of squash. Optional: you can drizzle the top layer with olive oil and some more salt and pepper if you like. Bake for 50-60 minutes, until the squash is tender when pierced with a sharp knife. Cool on a wire rack for a few minutes, then cut into squares and serve. This looks amazing! I have not switched to the Vegan lifestyle but am trying to eat healthier. I am going to try this recipe, thanks for sharing! Congrats on being in the Veghealth Awards for best healthy blog! Oh that is a great idea! Once the weather permits me to use my oven again (waaaaaaayyy too hot!!!! ), I'll be making this!